Losing 4 pounds in a week isn't unheard of -- especially if you've got significant weight to lose. The closer you are to your goal weight, though, the slower weight loss comes. To lose 4 pounds in seven days, you might have to resort to extreme measures that could affect your ability to lose weight after one week. Although you might have a goal you desperately want to reach, consider the implications of extreme measures for the long term. 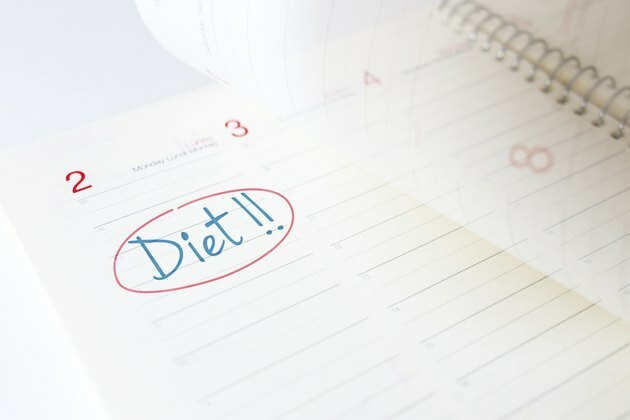 A sensible diet and exercise plan can help you lose some weight and feel better in a week, setting you up for a lifetime of healthy weight management. How much weight you'll lose in a week depends on the number of calories required to maintain your weight now. For most people, this ranges from 1,600 calories for a sedentary woman older than 50 to 3,000 calories daily for a young adult man. Since a pound equals 3,500 calories, it's generally recommended you aim for a 500- to 1,000-calorie daily deficit to lose a pound or two per week. If you burn up to 3,000 calories per day and can restrict your intake to 1,600 calories daily, you can lose almost 3 pounds in a week. Aim to eat at least 1,200 calories per day if you're a woman or 1,600 calories if you're a man, unless you're on a medically-prescribed plan. For most people, this is considered a low intake and will result in weight loss, but it's still enough calories to provide you with energy and a full range of nutrients. Eating fewer than 1,200 to 1,600 calories daily, even for a week, can slow your metabolism and make it harder to continue to lose weight once that week is over. Cut calories extremely and you'll likely feel unwell and tired and have trouble sticking to this highly restrictive plan, even for a week. When you first make changes to your eating and exercise program, you may experience faster weight loss in the first week -- especially if the changes are dramatic for you. This means that in a week you could lose 4 pounds or more with concerted effort. Much of this accelerated weight loss will come from water weight, not fat. If you return to your old exercise and eating habits after a week, you'll quickly gain back what you lost and sometimes gain even more. Giving up all processed foods and treats helps you maintain a low-calorie intake. Fast food, frozen dinners, restaurant meals, chips, soda, refined grains and sweets contain significant calories without offering a lot of nutritional value. If you have a heavy processed food habit, eliminating these foods will be challenging, but could have a notable effect on lowering your calorie intake, expediting weight loss that first week. Instead of convenience foods, seek whole foods from the perimeter of the grocery store, choosing vegetables, fruits, low-fat dairy, lean protein and whole grains. Each meal should contain some protein low in saturated fat -- whether it's meat, poultry, tofu or eggs -- a serving of vegetables and a 1/2- to 1-cup serving of whole grains, such as brown rice or 100-percent whole-wheat pasta. Prepare foods by roasting, grilling, steaming or baking. Avoid heavy sauces, bottled salad dressings and syrups. Instead, flavor your meals with spices, herbs and lemon juice or balsamic vinegar. Some unsaturated fat should be included at a few meals each day to support normal body functions and promote nutrient absorption. A teaspoon of olive oil, 1/8 avocado or 1/2 ounce of nuts is an appropriate serving size. These changes shouldn't be temporary. Once you reach your weight-loss goal, you may not have to maintain such an extreme calorie deficit, but eating more whole foods and avoiding processed ones promotes good health, maintenance of a healthy weight and optimal nutrition. Your serving sizes at meals depends on exactly how many calories you're eating to jump-start weight loss for the week. Remember not to eat fewer than 1,200 to 1,600 though. Breakfast options might include: 1/3 cup of dry oats cooked in water with 1/2 cup of berries, low-fat milk and 2 teaspoons of slivered almonds; 1 egg poached and served on a slice of 100 percent whole-wheat toast with an orange; a smoothie made with 1 cup of frozen raspberries, a container of plain Greek yogurt, a handful of raw baby spinach and a tablespoon of almond butter blended with a little water to thin it out; two slices of 100-percent, whole-grain toast topped with a tablespoon of peanut butter and 1/2 of a sliced banana; or a cup of shredded wheat topped with skim milk and a cup of sliced fresh strawberries. A large green salad fills you at lunch, but with minimal calories. Vary the vegetables you include, choosing from spinach, chopped kale, romaine, chopped peppers, cucumbers, radishes, steamed green beans, onions, shredded carrots and tomatoes. Top with a few ounces of grilled chicken breast, broiled flank steak, tuna canned in water or baked tofu. Use lemon juice or vinegar and olive oil for dressing. Dinner can be a 3-ounce grilled salmon fillet with a small sweet potato and steamed broccoli; a cup of whole-grain pasta topped with chopped tomatoes, a baked, lean ground-turkey patty and steamed zucchini; or roasted pork tenderloin with quinoa and boiled asparagus. Exercise burns calories, which contributes to a greater calorie deficit and more significant weight loss. If you have just one week, focus on cardiovascular exercise, such as brisk walking, jogging, circuit training or cycling. Your fitness level depends on how much you can exercise to lose weight in a week. Going from couch potato status to multiple high-intensity workouts over seven days is a recipe for injury and burnout. A gradual ramp-up to higher intensity exercise is warranted if you don't work out at all. You should still include it during the week when you're trying to lose 4 pounds and keep it up so it increases to at least 250 minutes per week over several weeks. According to the American College of Sports Medicine, a consistent 250 minutes per week, or more, of moderate-intensity cardio supports weight loss. Weight training also helps prevent the loss of muscle mass that often occurs when you create a calorie deficit. Expect to lose 25 percent of each pound as lean muscle if you don't exercise. If your goal is 4 pounds, that means a whole pound of muscle lost in one week. Plan on at least two sessions in a week and address every major muscle group with one exercise. Do eight to 12 repetitions of the exercise using a weight that feels heavy by the last couple of repetitions. Weight training also improves bone and joint health to enhance overall daily functioning. You won't see much difference in a week, but use it as a time to start a focused routine that you keep up for long-term health and body maintenance. National Health Service: Why is Gradual Weight Loss Better Than a Crash Diet? American Council on Exercise: What are the Guidelines on Percentage of Body Fat Loss? Can You Tone Your Stomach in a Week?